I've never been to LegoLand. I just wanted you guys to think I was cool. Community Season 5 Episode 4: "Cooperative Polygraphy"
Troy and Abed: Troy and Abed are in mourning! Jeff: Will you guys please stop doing that? Annie: I can't believe you did it during your eulogy. SO UNCOMFORTABLE. 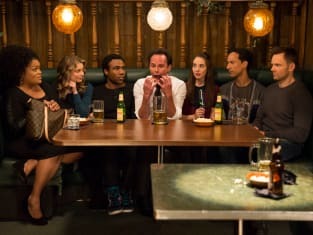 Abed: I don't think the audience got that we were singing "mourning" with a "u." Troy: You were singing :"mourning" with a "u"? Oh no! Permalink: "mourning" with a "u"? Oh no! I guess I knew Pierce was part of a weird, futuristic cult, but I wasn't prepared for a funeral with so much beeping.